Jean Perras supervised activities at the site and worked with authors of Isthmia studies and final preparation of “The Bridge of the Untiring Sea: the Corinthian Isthmus from the Bronze Age to Late Antiquity” eds. E. R. Gebhard and T. E. Gregory, Hesperia Suppl.47, forthcoming early 2014. Database and scanning of negatives and notebooks progressed under John Perras. Primary activity was re-organization/completion of the context and inventoried pottery; updating of computer records. Plaster lots transferred to plastic containers. In climate-controlled room inventoried metals, terracotta figurines were checked, re-organized and added to computer inventory. Martha Risser, Eugenia Doschori, Agnes Tessner Risser, Peter Tessner. Analysis of three main ceramic assemblages revealed their function in the sanctuary and changes that took place from the Early Iron Age to the Hellenistic period. Dedications occupied center stage, being found primarily (1) in fills predating the fire of ca. 460-450 B.C. within and around the Archaic Temple, (2) in terracing along the north side of the temple terrace, (3) and in the middle and upper levels of the Great Circular Reservoir. In the area of the Long Altar the decline in dedications and feasting-related pottery comes about a century earlier, suggesting a change in ritual behavior well before destruction of the Archaic Temple. 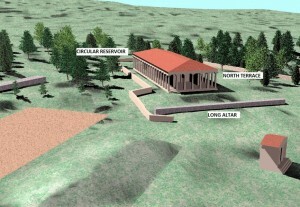 The primary assemblages of vessels related to feasting before the fire was found at the bottom of the Great Circular Reservoir. Further material related to feasts came from two dining caves used in the late 5th and 4th centuries and from the Sacred Glen where there was a sanctuary to Demeter. 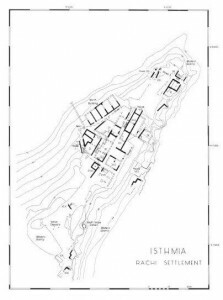 Details of house remains (beam holes, cut scarps, thresholds, steps, and drains,) on the south side of the ridge have revealed that occupation was more extensive and impressive than previously thought. While the settlement on top of the ridge is arranged on a linear plan (Fig. 2), perhaps to aid the production of olive oil, the pattern on the south slope where structures were cut into the bedrock and accommodated to the contours and levels of the hillside is more characteristic of a nucleated settlement. (The south side is along the right of the plan in Fig. 2). A comparison of the domestic pottery of the Rachi with that from the city of Corinth from the 4th and 3rd centuries B.C. 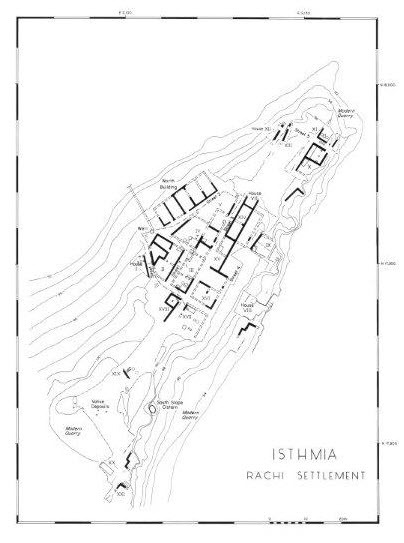 shows a higher proportion of vessels made in places other than Corinth, particularly the non-Attic and non-Corinthian black glazed table wares, perhaps due to the central location of the settlement on the Isthmus. As an example, the canteen, a very unusual shape in fired clay, is present in the settlement in three different shapes, each made in a different fabric. The boats form a significant and interesting group. Dedications at Isthmia seem to far out-number those at any other Greek sanctuary, on the basis of published material. Only the wooden boats from the Heraion on Samos occur in comparatively significant numbers. This pair of deities raises the question whether the choice of subject depends on the deity (most easily imagined for Poseidon) or rather the donor (which might hold for Samos). Boats are not common at other Poseidon sanctuaries and the bronze example illustrated here is unique.